The Passage takes design cues from the new Gore-Tex® Radius dry suit but in the lighter weight, high performance 3-layer Gore-Tex® fabric. 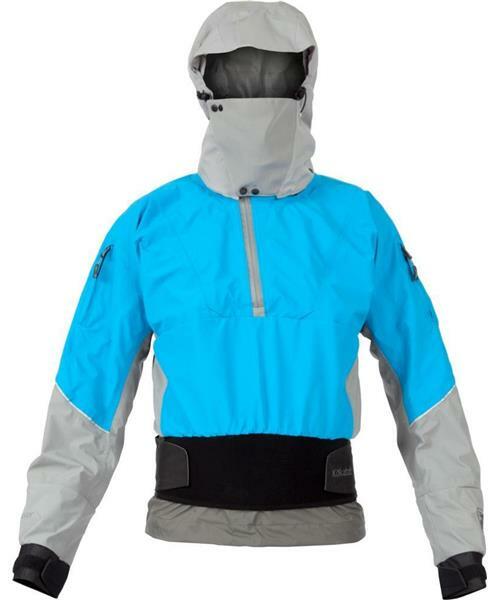 This is the top of the line touring shell for paddlers wanting the most technical features and fabric in a paddling jacket. Featuring a dual-adjustable outer skirt and cummerbund waist incorporating 'hook & loop' compatible neoprene, designed to integrate with a spray skirt or other Kokatat dry pants and bibs. The Passage has a fully adjustable lightweight hood that can be removed or stowed in its fleece lined outer collar and a deep asymmetric front zipper that provides additional weather protection for its adjustable inner gusseted splash collar. Additionally the top has easy to access, self-draining zippered pockets on each sleeve, reflective accents, and latex wrist gaskets.